The placebo effect. You think you're taking some medicine, and after a few days of treatment, you begin to recover from your illness. Low and behold, that medicine you were taking was really just a sugar-pill. Pharmaceutical companies rely on double-blind tests wherein one group of subjects receives a new medicine, and the other group receives a sugar pill. Neither the subject or the scientist know who receives what pill until after the test is complete (hence the double-blind label). This has been a time tested procedure to figure out the efficacy of a new medication - an anti-depressant for example. What has baffled science for decades is the fact that there is always a percentage of test subjects who receive the sugar pill and still experience the results expected from the actual medicine - the placebo effect. 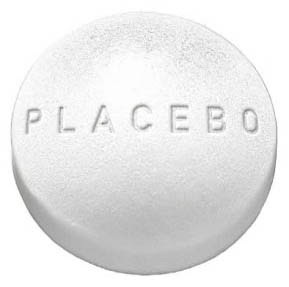 My interest in the placebo effect stems from the claim that the effectiveness of many traditional healers is really just the placebo-effect. Science has been unable (or unwilling) to explain many traditional healing practices that often combines spiritual healing with body healing (through herbal remedies). Researchers often claim that patients of traditional healers hold such strong beliefs about the effectiveness of their healer's treatment that the belief alone is what brings about healing - the placebo effect. "Many test subjects treated with the medication felt their hopelessness and anxiety lift. But so did nearly the same number who took a placebo, a look-alike pill made of milk sugar or another inert substance given to groups of volunteers in clinical trials to gauge how much more effective the real drug is by comparison. The fact that taking a faux drug can powerfully improve some people's health—the so-called placebo effect—has long been considered an embarrassment to the serious practice of pharmacology." The article goes on to say that scientists think the placebo effect is somehow getting stronger, and this poorly understood aspect of health and healing are beginning to put pharmaceutical companies into a crisis. The reasons are only just beginning to be understood. A network of independent researchers is doggedly uncovering the inner workings—and potential therapeutic applications—of the placebo effect. At the same time, drugmakers are realizing they need to fully understand the mechanisms behind it so they can design trials that differentiate more clearly between the beneficial effects of their products and the body's innate ability to heal itself. A special task force of the Foundation for the National Institutes of Health is seeking to stem the crisis by quietly undertaking one of the most ambitious data-sharing efforts in the history of the drug industry. After decades in the jungles of fringe science, the placebo effect has become the elephant in the boardroom. An interesting history of the placebo effect follows, along with a number of examples of how new medications are being thwarted by failing to be more effective than the placebo effect, and how this is affecting the industry. This is really interesting, and I think it has as much to do with rethinking illness as it does with rethinking treatment. I think it's an interesting concept here - if the mind can trick the body into healing itself, why not focus on how to enhance or further enable this to work. Could the awe, wonder and excitement of many indigenous healing ceremonies explain the efficacy of traditional medicine?